Celestial Halo made all of the running to cause an upset in the bet365 Long Distance Hurdle at Newbury. The nine-year-old, trained by Paul Nicholls and ridden by Daryl Jacob, gave owner Andy Stewart a fifth successive victory in the Grade Two after Big Buck's had won the previous four renewals. 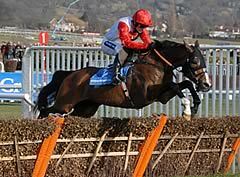 The race was left at his mercy after odds-on favourite At Fishers Cross made a bad mistake at the second-last flight. Celestial Halo (7-2) went on to score unchallenged by 17 lengths from Medinas, with Reve De Sivola third and At Fishers Cross last of the four runners. Jacob said: "I love this horse. There's no better pleasure than to win on this horse. "I'd gone an even gallop, but I didn't think I'd gone a crazy gallop. "This horse is very, very genuine. He loves galloping, he loves jumping. "He's an absolute hero - he just loves it." 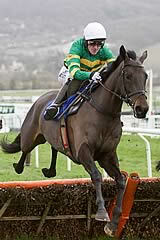 Celestial Halo and At Fishers Cross could now renew rivalry in the Long Walk Hurdle at Ascot on December 21. Nicholls said: "He's been an amazing horse, beaten a short head in a Champion Hurdle, and I thought his price was insulting given how well he run in France. "He had a gallop the other day with Rocky Creek and I couldn't believe how enthusiastic he was. "He'll now go for the Long Walk at Ascot and I'm sure he'll end up in the World Hurdle with Big Buck's." At Fishers Cross' trainer Rebecca Curtis said: "It's very disappointing, but it's not like he has run a bad race - it was a silly mistake that cost him. "He'll go to Ascot next month." Rebecca Curtis is keeping the faith with At Fishers Cross after he finished well beaten in the Long Distance Hurdle. The six-year-old was an odds-on favourite to make a winning return to action having landed Grade One novice prizes at Cheltenham and Aintree in the spring, but did not jump with his usual fluency in the hands of Barry Geraghty. He was still in with a chance of victory when he made a bad mistake two flights from the finish and Geraghty sensibly allowed At Fishers Cross to come home in his own time, eventually passing the post last of four finishers. Curtis expects her charge to improve considerably for the run and the Long Walk Hurdle at Ascot on December 21 is next on his agenda. The trainer said: "He's absolutely fine this morning and hopefully we'll have him right for Ascot at the end of the month. "It took him a couple of runs last season to really hit top form and I think it might be the same this year. "At the same time, I wouldn't say he was beaten when he made the mistake. Barry was quite confident he would have won. "He'll come on a lot for the run and we'll look forward to Ascot hopefully. It would be nice if the ground at Ascot was a bit softer than it was at Newbury. We certainly haven't lost faith in him just yet."